From 21 November to 11 December 2011 occasional poets could send their verses to the project’s Facebook page. Those poems that were given the highest rating from the public, were displayed on the screens and published in the Literární noviny. 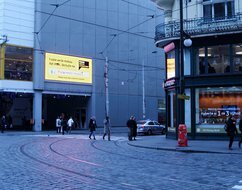 The winning poems could be read on Screennet’s large outdoor screens at the shopping centres in Palladium, Flora, Arkády Pankrác, the Avion Shopping Park in Zličín the My Národní třída shopping centre, at the Prague Congress Centre and also in the Literární noviny, which was the media partner of the Prague City of Literature project.